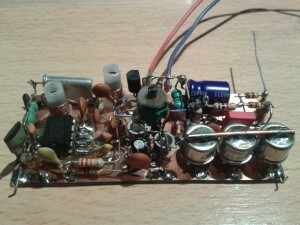 Since the VFO, LF and receiver seem to work without any problems, it was getting time to build the final parts: the transmitter board, the transmit/receive-switch and the lowpass filter. The transmitter is very easy to understand. It all starts with a VFO signal (2.100 … 2.150 MHz), mixed with an 8 MHz signal (xtal oscillator) by yet another NE612. The output signal of the mixer includes the sum frequency, which will be the carrier. Because the mixer also produces some other frequencies (e.g. 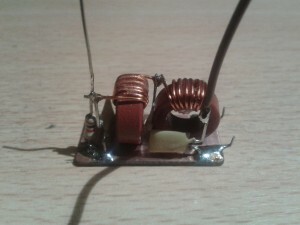 8 – 2.1 = 5.9 MHz) the mixer output is followed by a bandpass filter. The clean carrier is amplified by 3 stages. 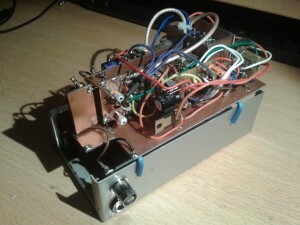 The final stage is a C-class transistor amplifier with 3 transistors parallel connected. The output is connected to the TX/RX switch, there was just enough space left on the board to include that circuit part. The transmitter board (just another piece of copper clad) has the same size as the receiver board, allowing to put them back-to-back in the case. I still had some room left in the case, more than enough to house the lowpass filter. I built it on another small piece of copper clad. Since I worried a bit about the power characteristics of those resistor-shaped inductors I made these myself, each inductor made of 8 turns of shielded copper wire on a T50-2 core. The transmitter board, from left to right: mixer with 8 MHz oscillator, first stage, second stage, final stage, TX/RX-switch. 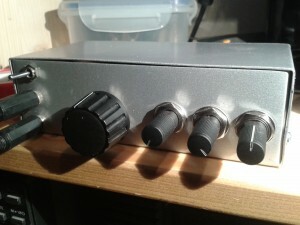 Thanks to my compact building work enough space remains available for a PI-filter and future extensions. All parts in place, all boards connected, ready to put into the case. When testing the transmitter board there was no output, and it drew just a few milliamps, so something was terribly wrong. I fired up my oscilloscope and soon found out that the 8 MHz crystal oscillator wasn’t running, caused by a broken NE612 mixer. I replaced the chip and the oscillator was running now. However, there was still no output… I turned around the cores and variable capacitor many times, but whenever I touched the morse key the needle of my power meter did not move. It was getting late so I turned of my soldering iron and went to bed. The next evening I did some more measuring, testing and reading. I found out that the first 2 stages operated very nicely, but the final stage (3x 2N3866 parallel) was not waking up. I tried to increase that input signal by slightly modifying the first 2 stages, without success. Then I read the datasheet of the 2N3866 and 2N4427 transistors again and found out that its emitter-base voltage is about 3.5 volts, while the 2N4427 (almost identical to the 2N3866) requires only 2.0 volts. I immediately ordered a bunch of 2N4427’s. Two days later they were delivered and I rebuilt the final stage. I pressed the morse key once more, looked up a bit nervously to the power meter. And yes! About 1 watt of power was leaving the rig and heating up the small dummyload. 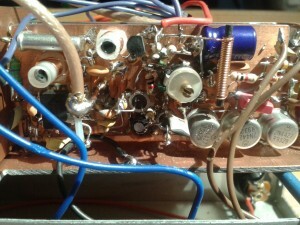 Rear view of the completed electronics. 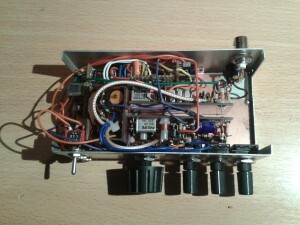 The modified transmitter board, now with the 2N4427’s installed. 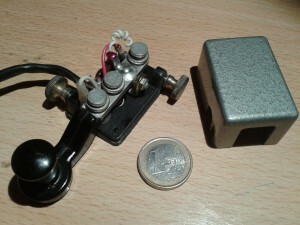 Jan PA1JT offered me this cute tiny morse key, perfect for backpacking! 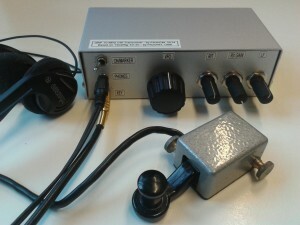 The transceiver is ready now. It was a very nice project to do. The construction with all those small boards happened to be very successful. The radio can be serviced easily by lifting the mainboard and removing/isolating one of the modules. The reception is great, the IF-filter is very nice. 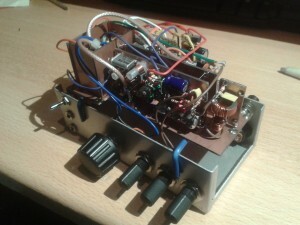 The VFO is very stable, I can just power on the radio and almost immediately start operating. The sidetone is rather loud compared to the received signal. I would have expected a bit more output power. A single 2N4427 has a maximum output power rating of 1 watt, so 3 should easily provide 2 watts. I’m thinking about adding a small capacitor parallel to the 100 ohm resistor in the second stage (emitter of the second 2N2222). For now the box is ready to prove itself. The first occurance will be my holiday to Scotland, during a hike in the beautiful Highlands. Maybe I will do some SOTA activation too. I finish this final part by saying thank you to Onno PA2OHH for his publication of this great little “NiceRig” 40-30.